This ticket was an impulse buy a couple weeks before, after @SFSKetchfest hyped it with all the fabulous guest stars that would be appearing. Once they said “Chris Meloni,” I was hooked. I wasn’t really sure what to expect, having never listened to the podcast, but like last year’s Paul F. Tompkins show, it featured actors I liked, so I was ready to go along with the ride. The show started with Busy Philipps and one of the regulars, dressed as secretaries from the fifties, reading a commercial for the fake coffee, Workjuice Coffee, that “sponsors” the program. It was funny enough, but when Paul F. Tompkins came out as the KING of Workjuice Coffee and made them kneel before him, I lost it! This was going to be a great show! The show was broken down into four smaller “adventures,” featuring recurring characters and the special guest stars. This particular show featured “Sparks Nevada, Marshall on Mars,” “The Adventures of Captain Laserbeam,” “The Cross-Time Adventures of Colonel Tick-Tock,” and “Beyond Belief.” I was delighted to see that the actors were dressed up, ladies in fifties/sixties dresses and gentlemen in suits. Each of the segments was fun, but I really enjoyed “Beyond Belief,” even though Chris Meloni wasn’t in it. I know, it shocked me too! Paget Brewster and Paul F. Tompkins were superb as Sadie and Frank Doyle, as was Paget’s dress. Plus Joshua Malina and Samm Levine were awesome genies. Chris Meloni was featured in the second segment with Captain Laserbeam. I was disappointed to see that he had just put a garish black, Ed Hardy-ish zip-up hoodie over his Wet Hot costume of jeans and t-shirt. Not sure if that was a character choice for him, or he simply forget to pack a suit for the trip, but I was sad I wouldn’t get to see Meloni in a suit after all. He stumbled a little over the lines, trying to read too fast, but they had given him these LONG speeches to read, so it seemed understandable. His character seemed to be the underwater equivalent of Captain Laserbeam, who is a little peeved that Captain Laserbeam came underwater to take of the Fishwife and Octopus Man without letting him know. Whether that was supposed to be a nod to Stabler’s penchant for getting pissy when others tried to usurp SVU’s jurisdiction, I don’t know, but it was a nice little in joke for me. He also employed a bit of a Steven Tyler stance with the microphone, one foot up next to the stand base and the other sprawled behind him, holding his script in front of him. This, combined with his attire, definitely made him stand out from the crowd. I was also a little disappointed that he only appeared in that one segment as some of the other guests appeared in multiple ones, but it was nice to see him twice in one night. Joshua Malina was delightful in all of his segments, from his Martian bartender that didn’t want trouble to his fabulous Oscar Wilde impersonation, I was dying. He never fails to impress whenever I’ve seen him on stage and it just makes me like him more. Busy Philipps was also killing it with her different voices. I’m still trying to pinpoint the inspiration for her villainess voice in the “Tick Tock” segment, but I’m pretty sure it’s from a Disney movie. Kevin Pollak was a great surprise in the last segment, though like Meloni, I wish I could have seen more from him. Andy Ritcher and Colin Hanks were HILARIOUS in the first sketch as Los Banditios Mutantes! I would watch an entire sketch about just them and their adventures. Suffice to say, I’m definitely a convert to this little show and I’m downloading the podcasts when I get home! Each year, SF Sketchfest releases their schedule of three weeks of amazing performances two days before tickets go on sale in December. I’m always in the middle of Christmas shopping and at a low point in my bank account. But there’s always one show that is my #1 pick, no matter how much tickets cost or what I have to do to get them. This year, it was Wet Hot American Summer, The Live Radio Play. This performance featured Michael Ian Black, Joe Lo Truglio, Ken Marino, Christopher Meloni, Marguerite Moreau, Amy Poehler, Paul Rudd, Molly Shannon, Michael Showalter, David Wain from the original cast as well as awesome additional like Colin Hanks, Bobcat Goldthwait, Busy Philipps, David Cross, Bruce McCullough, Andy Ritcher, Samm Levine, John Hodgman, Joshua Malina, Gillian Jacobs and many more less famous (to me) faces. David Wain read the names of all the participants at the end but the cheering was too loud to really hear anything. 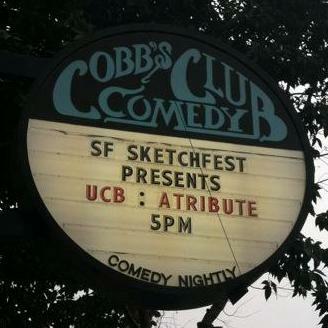 Luckily, SF Sketchfest posted the entire cast this morning on Facebook, so I now have a nice reference list. I watched the movie for the first time on Netflix over the last holiday weekend. It had been in my MUST SEE queue, as a Christopher Meloni fan, but having purchased tickets to this show, I knew I needed to see the real thing before watching the stage version. I fell in LOVE with the movie and the live radio play was everything I wanted it to be and more!